“Humpty is putting on a surprise show! Join him as he gathers together the Play School Toys to help with the big spectacular. There are starring roles for Jemima, Big Ted, Little Ted and guest appearances from other Play School favourites along the way. Filled with fun songs to sing and dance along with, this 40 minute show will delight Play School fans. Kids Promotions in association with the Australian Broadcasting Corporation is excited to announce everyone’s favourite Childrens Television show is heading on a national concert tour, Play School with “Humpty’s Showtime”, the tour will be commencing in March 2019 in Victoria. As with the television program, there are songs to move to, as well as quiet times to just watch and listen. 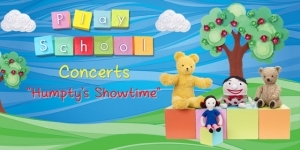 The concert is presented by two Play School presenters, along with everyone’s favourite Play School toys. The familiarity of the material and the presenters combined, totally engage the young audience and encourage lots of audience participation. Join Humpty and his friends in Humpty’s Showtime.